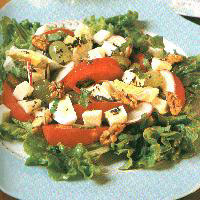 This is one of the most popular salads in North Cyprus. Light, refreshing and easy to make, it makes a perfect lunch under an olive tree by the sea. Quarter the tomatoes; slice them in thin segments if too large. Mix all the ingredients in a bowl and toss them gently. Serve fresh bread with it, to dip the juices in typical Cypriot fashion.